Pictured (L-R): Front Row: Missy Wilson, Sr. Creative Director, UMPG; Paul DiGiovanni; Rohan Kohli, Ozone Management. Back Row: Kent Earls, EVP/GM, UMPG Nashville; Ron Stuve, VP A&R, UMPG; Cyndi Forman, VP, Creative, UMPG; Robert Filhart, ASCAP. 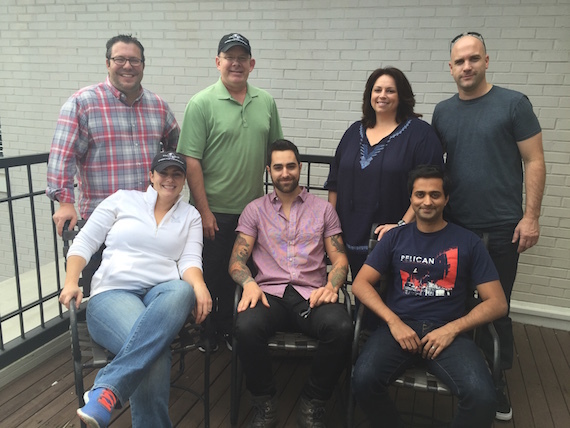 Universal Music Publishing Group (UMPG) has signed an exclusive, global publishing deal with songwriter/artist Paul DiGiovanni. Before transitioning into a full-time country songwriter/producer based out of Nashville, DiGiovanni spent nine years in Columbia Records pop/rock group Boys Like Girls, which sold over 1 million albums and over seven million digital singles. The band had six consecutive charting Top 40 radio singles (“Two Is Better Than One” feat. Taylor Swift, “Love Drunk,” “The Great Escape,” “Hero/Heroine,” “Thunder,” and “Heart Heart Heartbreak”) and multiple platinum singles. The band performed on Jimmy Kimmel Live, ABC’s The View, CBS’ Early Show, and MTV’s New Years Eve, and toured with such artists as Avril Lavigne, Butch Walker, and The All-American Rejects. “I couldn’t be more excited to become a part of UMPG. I felt immediately inspired by Kent, Missy and the whole team, and joining such a talented roster is a dream come true. Looking forward to a lot of hard work and success together in the future,” added DiGiovanni.